Women of the Blue and Gray, by Marianne Monson. 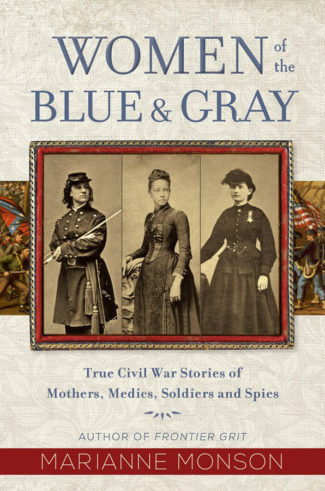 Women of the Blue and Gray, by Marianne Monson. Shadow Mountain, 2018. Marianne Monson teaches creative writing at Portland Community College as well as at private workshops and retreats. She also acts as an “Artist in Resident” in school classrooms, helping children discover their creativity. Her degrees are from Brigham Young University and Vermont College of Fine Arts. She has published ten books for adults and children, many of them historical fiction or creative non-fiction, as well as articles and blogs for various audiences. Several of her books focus on women and children on the American frontier. For all that has been written about the American Civil War, most of us know little about what it meant for women on either side or about their contributions to the conflict. We tend to think that “war” is what men do while the women are safe at home. This book reveals how wrong that image actually is. As Monson reveals, women fought on battlefields alongside husbands or while posing as men. They did the work of feeding, clothing, and nursing, keeping men able to fight and helping them die. They were spy and consultants. Doing what we usually consider as “men’s work,” they provided for families and communities. In addition, there are stories of women in the middle states were shifting battle lines meant that soldiers showed up on their doorsteps. As we see, the guerilla warfare that characterized the Civil War makes women central actors in the fighting and devastation. Manson has done a thorough job of researching these stories and organizing a great deal of information into a coherent book. She documents where she found anecdotes, but does not try to analyze. Instead she tells an engaging narrative, accessible to older children and adults. I strongly recommend this book for all readers who need to understand what war means to women as well as men. ← Always Another Country, by Sisonke Msimang.